9 sites, November 09—All races were contested at 6K (3.73M). 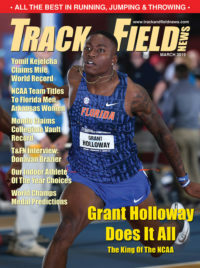 Tallahassee, Florida—Georgia may have topped the regional rankings for much of the season, but when it came down to it, Florida State and the fast-improving Florida squad grabbed the two auto qualifiers. The Seminoles put 4 in the top 20 on their home course at Apalachee Regional Park. Militsa Mircheva, their senior from Bulgaria, who didn’t move into the lead until the final K and wound up with a 6.6-second win over Florida’s SEC champ Jessica Pascoe, 20:17.0 to 20:23.6. Georgia’s Jessica Drop took 3rd (20:29.4). The second runner for Florida State was Elizabeth Funderburk in 8th (20:43.4), scoring top frosh honors. Florida State (60) edged Florida (60), with ’17 champ Ole Miss (87) and Georgia Tech (144) left hoping for at-large qualifiers. Georgia, which had started the season in great shape, may have to stay home after scoring 165 for 5th. Missing from the Bulldog lineup was defending champion Samantha Drop, redshirting this season. The early lead was taken on by Tennessee Tech’s Purity Sanga, who ended up 7th in 20:43.0, and Joyce Kimeli of Auburn, 4th in 20:33.1. “I’ve never seen this much energy on a team since I’ve been here,” said prescient Seminole coach Kelly Phillips before the race. “It will be fun.” It will be the first visit to Nationals since ’14 for the team, and the first trip with Phillips as coach. Teams: 1. Florida State 60; 2. Florida 64; 3. Mississippi¶ 87; 4. Georgia Tech¶ 144; 5. Georgia 165; 6. Vanderbilt 183; 7. Tennessee 221; 8. Alabama 231; 9. Middle Tennessee 236; 10. Lipscomb 240. 11. **Maudie Skyring’ (FlSt) 20:58.2; 12. ***Pamela Kosgei’ (MTn) 20:58.8; 13. *Sandra Szpott (SnMs) 20:59.1; 14. ***Lisa Vogelgesang’ (Ms) 21:00.3; 15. *Amy Ruiz (GaT) 21:03.4; 16. Carley Lutzow (FlGC) 21:03.8; 17. ***Haley Walker (Vand) 21:05.8; 18. *Megan Mooney (FlSt) 21:06.7; 19. *Courtney Brenner (Lips) 21:09.4; 20. **Madeleine King (Ms) 21:09.9; 21. ***Imogen Barrett (Fl) 21:10.9; 22. ***Hana Herndon (GaT) 21:12.2; 23. Grace Tavani (Ga) 21:12.3; 24. **Jodie Judd (FlSt) 21:12.4; 25. ***Ylva Traxler (Ms) 21:12.8. Buffalo, New York—As expected Columbia came through to win handily at snow-covered Audubon Golf Course, putting 5 in the top 13 to score a stunning 41 points. The surprise came in the other team scores, as Syracuse, ranked No 2 in the region, fell to 6th. Dartmouth (88) took the runner-up spot ahead of Yale (940 as Cornell (120) and Iona (143) both bettered Syracuse’s 155. The Dartmouth Big Green also put together a nice pack, placing 10-11-14-16 and crossing fingers while their No. 5 finished in 37th. 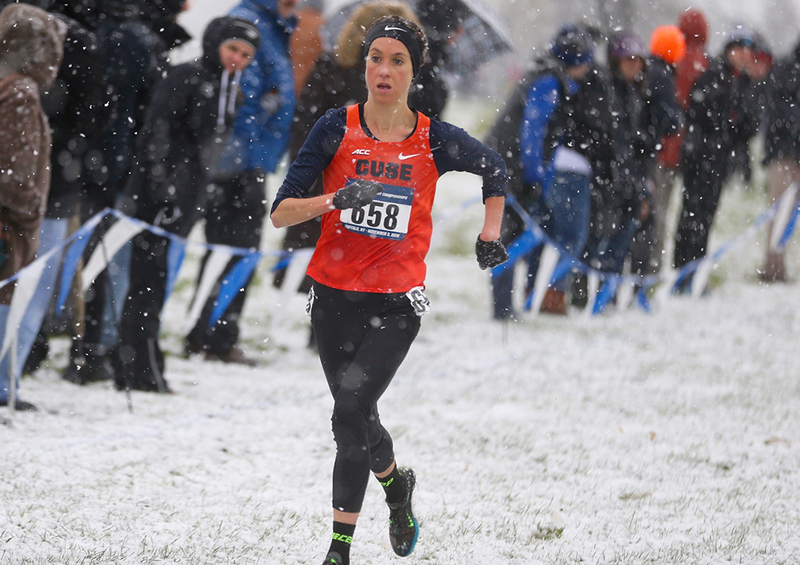 Individually, senior Shannon Malone of Syracuse—in only her second race of the year—moved into the lead by halfway and romped to an 11.2-second win over Iona’s Eglė Morenaitė, 21:28.7-21:39.9 with Lisa Tertsch of Harvard in 3rd (21:40.4). Libby Kokes of Columbia (21:43.6) led a 4-7-8-9-13 finish for the Lions, with runners 2-5 all bunched within 14 seconds. 1. Columbia 41; 2. Dartmouth 88; 3. Yale 94; 4. Cornell 120; 5. Iona 143; 6. Syracuse 155; 7. Brown 182; 8. Harvard 231; 9. Boston College 271; 10. Providence 366. 11. *Lauren Sapone (Dart) 22:10.7; 12. ***Morgan McCormick (Yale) 22:14.0; 13. **Alexandra Hays (Col) 22:14.1; 14. *Georgia Fear (Dart) 22:14.4; 15. **Gemma Nuttall (Iona) 22:16.2; 16. *Julia Stevenson (Dart) 22:16.8; 17. Lucy Srour (Brown) 22:17.6; 18. Annie Taylor (Corn) 22:19.5; 19. Siobhan Quinn (Canisius) 22:20.5; 20. **Kayley DeLay (Yale) 22:21.3; 21. Mary Malone (Syr) 22:21.6; 22. **Isabella Dobson (Corn) 22:22.3; 23. *Hannah Reinhardt (Alb) 22:23.6; 24. *Jenna Gasparrini (HC) 22:25.2; 25. **Sophie Murphy’ (Iona) 22:26.8. College Station, Texas—Unbeatable. That’s the best descriptor for a team that scores 21 points to defeat a 22-team field and produce its 8th straight Regional win. Lance Harter’s Arkansas women pummeled the competition on the Dale Watts course, sweeping places 1-4 and adding 11th. Frosh star Katrina Robinson stayed at the front throughout, the Aussie bolting to an 8.7-second win in the closing stages as teammates Taylor Werner and Lauren Gregory finished 2-3 in the same 20:29.0, and Carina Viljoen took 4th in 20:33.9. The first non-Razorback was SMU’s Hannah Miller in 5th (20:36.6) and Allyson Girard of A&M Corpus Christi took 6th in 20:41.5. As expected, Texas grabbed runner-up honors, scoring 99 points to the 122 of Texas State. Texas A&M (154) and Rice (162) rounded out the top 5. 1. Arkansas 21; 2. Texas 99; 3. Texas State 122; 4. Texas A&M 154; 5. Rice 162; 6. SMU 166; 7. Baylor 248; 8. LSU 262; 9. UT Rio Grande Valley 280; 10. Texas A&M Corpus Christi 290. 11. Sydney Brown (Ar) 21:07.2; 12. *Leslie Romero (TxSt) 21:11.1; 13. *Micah Huckabee (Ar) 21:13.0; 14. *Maddy Reed (Ar) 21:13.5; 15. Rea Iseli’ (NTx) 21:18.9; 16. Shanieke Watson (ArLR) 21:20.0; 17. ***Ryann Helmers (Rice) 21:21.6; 18. **Arina Kleshchukova’ (NO) 21:24.1; 19. **Sydney Cole (TxSt) 21:28.0; 20. *Abby Guidry (Tx) 21:28.1; 21. *Kendra Long (TxSt) 21:28.1; 22. ***Mercy Chelangat’ (TxRGV) 21:30.5; 23. Anneke Grogan (SMU) 21:31.3; 24. *Kelsie Warren (TxAM) 21:34.1; 25. *Khayla Patel (Rice) 21:36.3. Terre Haute, Indiana—Mike McGuire’s Michigan squad handily outpaced Big 10 rival Wisconsin to capture the Regional crown, 47-82 on a cool (temps just above freezing) day. The Wolverines put together a 3-4-10-14-16 finish, led by frosh Anne Forsyth in 3rd. Forsyth, who only started wearing the maize and blue jersey for the Big 10 meet, ran 3rd in 20:32.6. Senior Avery Evenson came in 4th at 20:36.2. The Wolverines moved up well in the final kilometer, chopping 15 points off their score in that stretch, capturing their fourth straight in the process. It will be the 17th consecutive Nationals for the team. The individual crown went to Wisconsin’s Alicia Monson, who is continuing to romp in her fairytale breakthrough season after wins at the Nuttycombe Invitational and the Big 10. She clocked 20:13.5 for a comfortable margin over Notre Dame’s Anna Rohrer (20:20.1). In 5th came Michigan State junior Annie Fuller (20:41.1), keying a strong 3rd-place finish for the Spartans, with 89 points just 7 shy of Wisconsin and probably locking down an at-large bid. It would be an 18th-straight Nationals for Michigan State. Only Stanford (25) has a longer streak. 1. Michigan 46; 2. Wisconsin 82; 3. Michigan State¶ 89; 4. Notre Dame¶ 100; 5. Indiana¶ 137; 6. Eastern Michigan 231; 7. Ohio State 265; 8. Purdue 279; 9. Toledo 297; 10. Butler 317. 11. *Amy Davis (Wi) 20:48.3; 12. **Maggie Farrell (MiSt) 20:51.5; 13. Erin McDonald (MiSt) 20:52.2; 14. ***Camille Davre (Mi) 20:53.2; 15. Natalie Cizma¶s (EnMi) 20:53.9; 16. Claire Borchers (Mi) 20:54.8; 17. *Athena Welsh¶ (Tol) 20:55.2; 18. Shaelyn Sorensen (Wi) 20:56.2; 19. Katherine Receveur (In) 20:56.6; 20. Rachel DaDamio (NDm) 20:57.5; 21. Jessica Harris (NDm) 20:58.1; 22. *Jeralyn Poe (MiSt) 20:59.1; 23. Rachel Walny (BG) 21:00.1; 24. Megan O’Neil (CMi) 21:02.3; 25. **Alissa Niggemann (Wi) 21:03.9. Peoria, Illinois—In one Regional that stayed true to the formcharts, the Iowa State women put 3 in the top 12 to outdistance Oklahoma State, 78-140, and win their third straight crown in breezy, overcast conditions at Newman Golf Course. Minnesota took 3rd (185) while Illinois (203) and Northwestern (205) took the next two spots. The Cyclones went out cautiously, scoring in 3rd place at the 2K mark before taking control of the race. Sharon Lokedi of Kansas ran from the front throughout the race before succumbing to the powerful kick of Iowa State’s Big 12 champ Cailie Logue, who finished nearly 10 seconds ahead, 20:13.5–20:23.0. Winny Koskei of Wichita State bided her time deep in the pack in the early going, then finished well to run 3rd (20:23.0), nearly catching the fading Lokedi at the line. Aubrey Roberts of Northwestern finished 4th (20:24.0) and Oklahoma’s Haley Herberg was 5th in 20:26.7. “We have some pretty big goals, lofty goals, and they have not faltered or wavered from that at all,” said first-year Cyclone coach Amy Rudolph. The Oklahoma State women’s placement in the top 2 was the seventh time the Big 12 runners-up had done so in the last 9 years. 1. Iowa State 78; 2. Oklahoma State 140; 3. Minnesota¶ 185; 4. Illinois 203; 5. Northwestern 205; 6. South Dakota 217; 7. Kansas 229; 8. Tulsa 233; 9. Bradley 236; 10. Wichita State 255. 11. **Erika Freyhof (Nb) 20:46.2; 12. **Amanda Vestri (IaSt) 20:53.7; 13. **Caitlin Klopfer (Tuls) 20:55.8; 14. **Ashley Tutt (NnIl) 20:56.0; 15. *Gabby Juarez (Brad) 20:56.5; 16. **Sinclaire Johnson (OkSt) 20:58.1; 17. *Rebekah Topham (Wich) 20:59.9; 18. **Allison McGrath (Il) 21:01.0; 19. Rachel King (SDSt) 21:01.9; 20. ***Reilly Revord (Mo) 21:07.2; 21. *Sarah Nicholson (NWn) 21:08.9; 22. Megan Billington (SD) 21:10.4; 23. Grace Baker’ (OkSt) 21:13.4; 24. **Taylor Somers (OkSt) 21:14.4; 25. ***Madison Marasco (Il) 21:14.7. Rock Hill, South Carolina—With temps around 50 at Winthrop Farms, NC State didn’t have to worry about the weather in wrapping up its third straight title. Coach Laurie Henes’s squad did have to worry about Furman, however. A strong Paladin group had a 3-point lead at halfway, and the Wolfpack had to go into overdrive to reel them in and put together a 70-94 win before the finish. Duke finished 3rd with 139, while Wake Forest (163) and Virginia Tech (181) took the next two spots. The key for the winners might have been the team’s improvement. Though ranked No. 1 in the region going in, it didn’t hurt that runners 4-7 produced lifetime bests over the 6K course. The individual race went to Louisville’s Dorcas Wasike, the ACC champion, whose only loss this fall came in placing 3rd at Pre-Nationals. Wasike led from the start, content to let a huge pack closely trail her before she floated away for a 5-second victory over NC State’s Elly Henes, 19:42.1 to 19:47.6. Furman’s Savannah Carnahan took 3rd at 19:54.5 while Hannah Steelman of Wofford captured 4th in 19:56.5 and the Wolfpack’s No. 2, Dominique Clairmonte, crossed a few steps later at 19:59.0. 1. NC State 70; 2. Furman 94; 3. Duke 139; 4. Wake Forest 163; 5. Virginia Tech 181; 6. Virginia 192; 7. Eastern Kentucky 194; 8. Richmond 256; 9. Clemson 264; 10. Kentucky 278. University Park, Pennsylvania—Racing on Penn State’s Blue & White Golf Course, the Villanova women came through as predicted with a 33-point performance while a determined Princeton squad snatched the No. 2 spot with 64 points, beating Penn State (91) and Temple (58) handily. Penn (171) finished 5th. The race was affected by rain and mud, which Villanova’s Rachel McArthur weathered best, her 21:03 giving her a 6-second win over LaSalle’s Grace Mancini. Nova’s Caroline Alcorta (21:12) finished 3rd, Madeline Villalba of Penn 4th (21:15) and the third Wildcat, Canadian Nicole Hutchinson, took 5th in 21:20. It is the fourth straight year for Gina Procaccio’s Villanova team to head to Nationals, and the 30th time in program history. It is also the 15th Regional crown for the Wildcats. 1. Villanova 33; 2. Princeton 64; 3. Penn State¶ 91; 4. Temple 158; 5. Penn 171; 6. West Virginia 217; 7. Georgetown 236; 8. Bucknell 237; 9. Pitt 298; 10. Maryland 331. 11. Madison Offstein (Prin) 21:32.4; 12. Alie Fordyce (Prin) 21:33.1; 13. Allie Klimkiewicz (Prin) 21:33.2; 14. Emily Bracher¶ (Md) 21:33.5; 15. ***Taryn O’Neill (Vill) 21:33.9; 16. **Paige Hofstad (Gtn) 21:36.7; 17. **Danielle Orie (Penn) 21:38.7; 18. *Kathryn Munks (PennSt) 21:39.1; 19. Colleen Buckley (Buck) 21:41.4; 20. **Melia Chittenden (Prin) 21:42.0; 21. *Grace Moore (Tem) 21:43.5; 22. *Kira von Ehren (Tem) 21:44.6; 23. *Suzanne Dannheim (GWa) 21:44.9; 24. ***Reilly Seibert (Vill) 21:46.0; 25. ***Moria O’Shea (PennSt) 21:47.3. Provo, Utah—In an epic clash of titans, New Mexico handled Colorado in a low-scoring battle that saw the Lobos top the Buffs by just 12 points, 41–53. A fast lead pack, headed by Air Force’s Jaci Smith and New Mexico’s Weini Kelati, started to thin out before 4K, when Kelati began to build a solid margin. At 5K, it was Kelati in 15:55.6 and teammate Ednah Kurgat next at 16:10.7. Kelati held that margin on the way to her third straight win of the year, crossing in 19:15.0 with Kurgat at 19:31.7. Third went to BYU’s Erica Birk (19:34.9) and 4th to Smith at 19:44.1. Angie Nickerson of Southern Utah grabbed 5th in 19:57.6 ahead of Colorado’s first three: Dani Jones, Makena Morley and Tabor Scholl, all in 20:01-point. “We knew that they were just saving a gear and thinking next week,” said Colorado coach Mark Wetmore. New Mexico controlled the team race from the start, never falling behind Colorado at any of the kilos. In 3rd came BYU at 85 points, and Southern Utah (155) and Air Force (170) took the next two spots. The Lobos, 11-time winners of the Mountain West, added to that honor an 11th straight Nationals berth, although this was the first time the Lobos had won since ’11. 1. New Mexico 41; 2. Colorado 53; 3. BYU¶ 85; 4. Southern Utah¶ 155; 5. Air Force 170; 6. Northern Arizona 214; 7. Utah State 222; 8. Weber State 243; 9. Colorado State 280; 10. Nevada 286. 11. Charlotte Prouse’ (NM) 20:05.5; 12. **Adva Cohen’ (NM) 20:05.6; 13. *Winny Koech’¶ (UTEP) 20:10.1; 14. Val Constien (Co) 20:17.9; 15. Emily Martin (NM) 20:18.4; 16. **Sophie Eckel’ (NM) 20:19.2; 17. Cierra Simmons¶ (UtSt) 20:25.0; 18. Tayler Tuttle (Co) 20:26.0; 19. Mackenzie Caldwell (Co) 20:26.6; 20. **Anna Camp (BYU) 20:30.6; 21. *Hiley Dobbs (Nv) 20:30.8; 22. ***Jesselyn Bries (NnAz) 20:38.0; 23. *Olivia Hoj (BYU) 20:42.5; 24. **Maria Mettler (AF) 20:43.9; 25. *Sarah Feeny (Ut) 20:46.6. Sacramento, California—Boise State pressed Oregon to the wire, but the Ducks prevailed, 44–49. Stanford placed 3rd (95) ahead of Washington (118) and Portland (144). The early leader, Boise State succumbed to Oregon’s pressure, as the defending champions finished in 2-3-7-13-19, compared to Boise’s 1-6-11-15-16. For the Ducks, now under new distance coach Helen Lehman-Winters, it will be the 30th time the team has qualified for Nationals. Nineteen of those berths came from winning an automatic spot. For Boise State, it is only the third time the team has gotten an automatic bid, the previous instances coming in ’14 and ’15. Stanford and Washington are both looking like probable at-large qualifiers. The individual race went to Boise’s Allie Ostrander, whose 19:09.0 left Oregon’s Jessica Hull far behind at 19:22.5. In 3rd came Susan Ejore of Oregon (19:24.6). Stanford’s Elise Cranny (19:26.2) and Fiona O’Keeffe (19:27.0) took the next two spots. 1. Oregon 44; 2. Boise State 49; 3. Stanford¶ 95; 4. Washington¶ 118; 5. Portland¶ 144; 6. Oregon State¶ 196; 7. UCLA 215; 8. Cal Poly 232; 9. San José State 273; 10. USF 276.